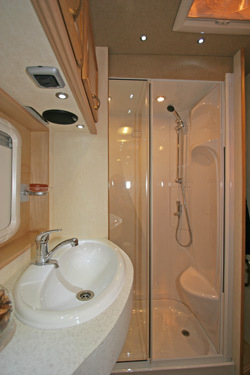 Caravan Guard reports on prize winning caravan washrooms as judged by the Caravan Industry. The Caravan Industry Best Washroom Awards were judged and presented in October during the International Caravan and Motorhome Show at Birmingham’s NEC. 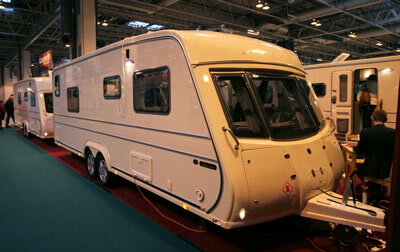 and overall impression in relation to the size and price of the caravan. Each category is marked out of 20, meaning up to 140 points can be allocated to each washroom. Highest mark allocated to a caravan washroom by a judge this year was 121 points. 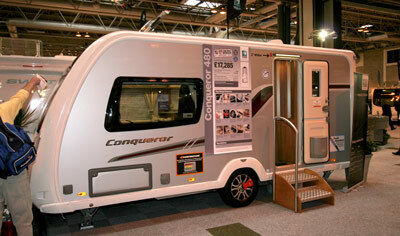 The winner was the Conqueror 480 by Swift, an end washroom model, with Mali Acacia wood interior finish. We thought it had a certain feeling of spaciousness about it and we liked the white one-piece shower pod with chrome accessories, two shelves for toiletries and a light. We noted the inwards opening clear acrylic door. The granite-look basin and shaped surround with an up stand are new for 2011 and give the opportunity for a cupboard with one shelf under it; space is slightly inhibited by some pipe work. The wardrobe, with an auto light feature housed the ALDE wet heating system header tank, three shelves and three small drawers. A Thetford C250 toilet with a wheeled 18 litre holding tank completes the necessary equipment. This was a very close contest with the winner scoring only one point more than the runner-up. *Caravan insurance cost based on 2011 Swift Conqueror 480 valued at £17,653, fitted with hitchlock, Al-Ko secure and alarm (standard on this model). Kept on drive at HX4 0BE. Caravanners over 30 years old, claim free for 3 years and a member of a caravanning club. Premium includes insurance premium tax at 6% and is correct as of 19.01.11. The runner-up was the Applause 580 SB EW by Vanmaster. 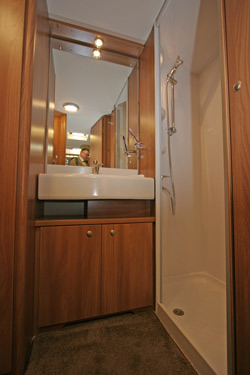 This end washroom on this hand crafted caravan sported a large shower cubicle with a seat, two individually controlled LED lights and a sliding door. A stylish granite look oval shaped basin still allowed plenty of space for toiletries and the ALDE towel rail was set in a space that could be adapted for optional shelves or hooks too. There was also a heated towel rail beside the Dometic CT3000 swivel toilet. Lighting was very good with five LED lights over the basin. The wardrobe had an auto light and there were roof lockers for storage too. *Caravan insurance cost based on 2011 Vanmaster Applause 580 SB EW valued at £30,950, fitted with hitchlock, alarm and Al-Ko ATC (both standard on this model), Al-Ko secure wheel lock (receiver fitted – lock is an optional extra) and approved tracking device (optional extra contact Vanmaster for prices). Kept on drive at HX4 0BE. Caravanners over 30 years old, claim free for 3 years and a member of a caravanning club. Premium includes insurance premium tax at 6% and is correct as of 19.01.11. So what do you think of the models that won this award? Do you think the washroom is an important factor when choosing a caravan, or would you sacrifice washroom space and storage for extra sleeping or living space? Share your thoughts by leaving a reply below. Hi Mr Rogers, While I can’t promise that we can cover this particular motorhome, there has been a review of the Rimor New Polaris Veloce 480 on the Out and About Live website you could take a look at.